Travelling to Highworth really couldn't be easier. 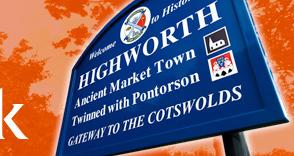 Located about 6 miles north-east of Swindon town centre, Highworth is within easy reach of all main roads and motorway junctions. Take the A361 south from Burford through Lechlade towards Swindon. Climb the hill into Highworth. At M4 Junction 15 (Swindon) take the A419 North towards Cirencester. Just after the Honda factory on your right, leave the dual carriageway and follow the A361 into Highworth. Highworth is off the main A420 from Oxford to Swindon. From the A420, take the B4508 minor road into Highworth. Follow the A419 towards Swindon. After climbing Blunsdon Hill, take the B4019 (left) at the Cold Harbour and follow the road into Highworth.